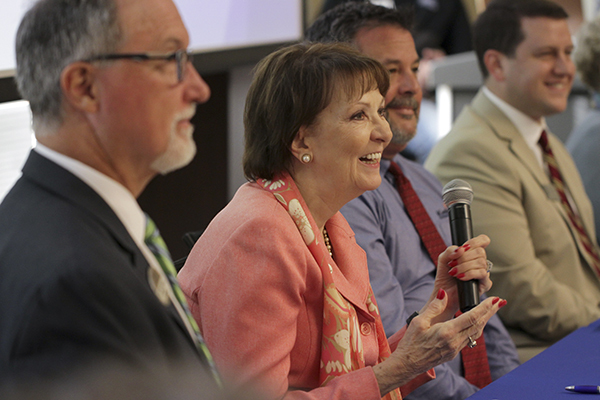 UNG President Bonita Jacobs talks during a panel discussion with other education and community leaders on the Gainesville Campus. On Sept. 25, University of North Georgia (UNG) President Bonita Jacobs hosted a group of local education and community leaders on the Gainesville Campus to discuss a collaboration among school systems, technical colleges and UNG. Included in the discussion were Dr. Ray Perren, president of Lanier Technical College; David Moody, executive director for leadership development for Hall County Schools; Jeremy Williams, superintendent of Gainesville City Schools; and Kit Dunlap, president and CEO of the Greater Hall Chamber of Commerce. "We have a wealth of opportunities to educate our students in Hall County and to develop them to be the workforce of the future," Dunlap said. 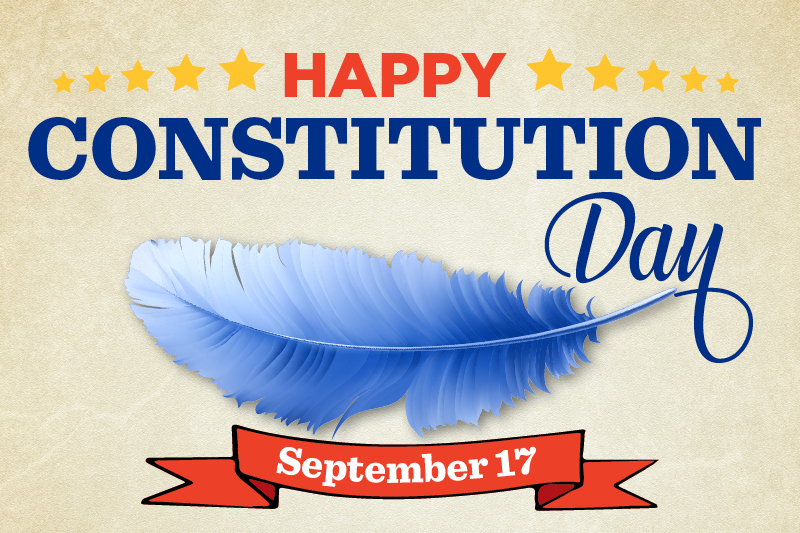 "And the organizations present today all play a crucial role in this effort." Panelists pointed to the success of dual-enrollment programs where students earn high school and college credit at the same time. 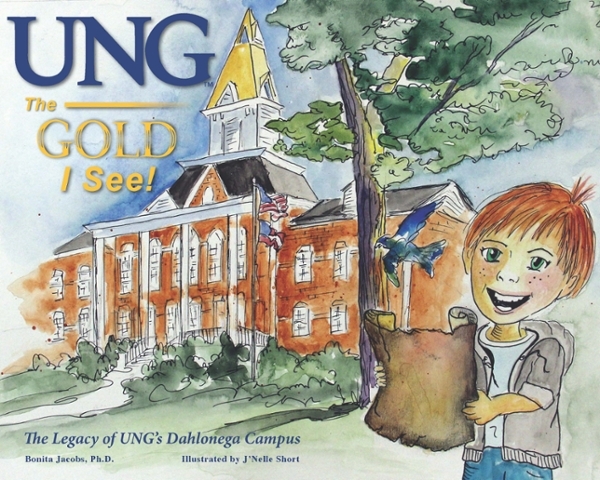 Jacobs said UNG has partnered with schools in dual-enrollment programs in all of the counties of its five campuses. "Dual-enrollment is growing very rapidly," Jacobs said. "It is one of the fastest-growing segments of the freshman class this fall at UNG." 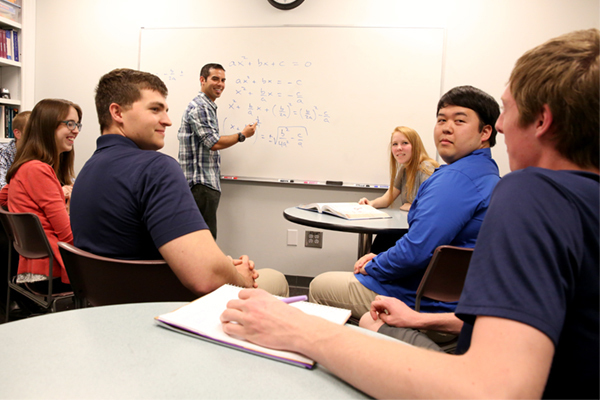 At little or no cost to the students, they can accelerate their college education so that there are some students who, when they graduate from high school, come into UNG with almost their sophomore year completed. That opens up so many opportunities such as the ability to pursue a double major or take a semester or a year to study abroad." Hall County is in its second year of Early College @ Jones, which houses one of those dual-enrollment programs. In that program, UNG and Lanier Tech instructors teach courses at the Early College site. "It’s been amazingly successful in a sense that you’re talking about taking in young kids that are taking their first dip into the college world," Moody said. "And we can keep some training wheels on and offer a lot of support for them, so that they get the habits for being successful." Williams added his school district is working to help give students skills to enter the workforce. "All of our kids, when they leave Gainesville High, we want them to be employable," Williams said. "Our future in this region is dependent on the success of our youth." Moody said apprenticeships are also a benefit of the partnerships with Lanier Tech and UNG. "We have some students who are going into apprenticeships right now with local industry and with the support of local universities like UNG and Lanier Tech," Moody said. "It’s all about helping students find their vision." Perren said dual-enrollment programs have lowered the average age of students at Lanier Tech, with 44 percent of students this fall younger than 21. "That’s the highest percentage we have ever had," Perren said. "Typically, our population has tended to be 28 or 29 years old and upward. As the economy continues to boom and as Move on When Ready, now called the dual-enrollment program, has continued to prosper Georgia, our average age has continued to decrease." Moody said Hall County is working to develop leaders in response to a "national crisis in regards to leadership in this country in education." "We've been very intentional about developing future leaders, school-level leaders, and system leaders as well," he said. "In addition, we've worked with school-level teaching leadership with peer coaching and improving the practice of teaching. We have just begun our aspiring principals group where we're working on our future principals in our school system. We've taken ownership of leadership development, and it's starting to really pay off and make a difference."